But did get us talking about rabbit as a meat. 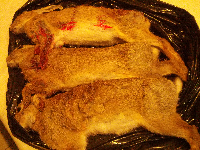 Now my Nan told me stories of skinning rabbits as a girl and tucking into stew, but its not something I grew up eati g. So when and why did it fall out of favour? So why readily available, nutritious meat be so unacceptable today as it was in my Nan's generation? Brown off onion and garlic in pan.